Taste of summer in yellow squash chips. The bounty of the garden always comes alive with the baskets of yellow summer squash making their way into my kitchen. I am always looking for new ways to work them into my meal plans so this year I found a way to work them into my snack plan. With the help of my dehydrator, and my love for dried vegetables I have been filling my pantry with jars of dried yellow squash chips. A super easy salty snack that will last long after all the yellow summer squash has been picked. Slice and wash six small yellow squash cut into 1/8″ slices. In a large bowl add squash, 2 teaspoons sea salt and 2 teaspoons olive oil and mix well coating each slice. Place in a single layer on dehydrator trays. Mine holds about one squash per tray and I have 6 trays. Set the temperature to 130 degrees and dry for 6 to 8 hours. Drying time varies according to your homes humidity and your individual dehydrator, start checking after five hours. 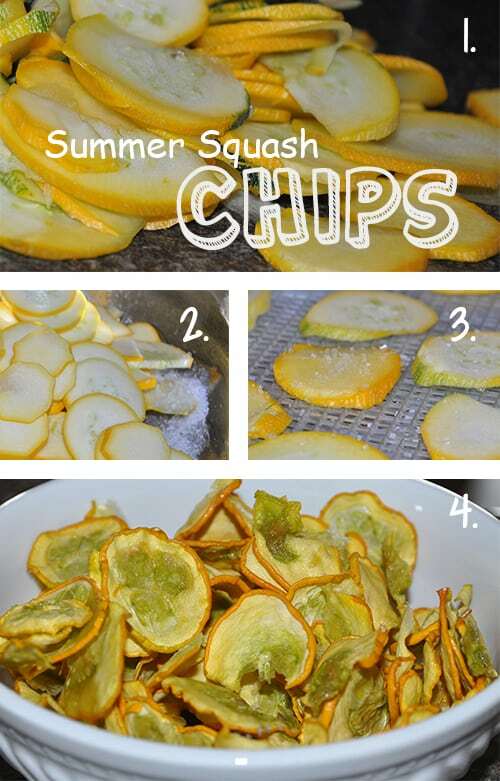 Your summer squash chips are done when they are crispy. This is just one way I am using up my summer squash. What great things are you doing with yours? Our squash always goes crazy, so this is a great way to use them up. I made tossed salad last night for dinner and put a few on top of our salads…it was wonderful! Enjoy your cool weather, it is 96 here in South Carolina today. I love yellow squash. I don’t have a garden anymore so I don’t get very much! I sure miss it. I’ve never trying dehydrating them. I would love to! Thanks for sharing this! I loved visiting you. I am following now. I’ll be back. Thanks for stopping by! This is the season for summer squash…wish you lived near me I would give you some so you could try drying it! I checked out your blog and can’t wait to hear more about your journey in apartment living. What a great idea. These look so tasty!! Thank for sharing this Tracy! Do you think it would be tasty with zucchini? Zucchini works as well I have even used Patty Pan squash and they work too. Any summer squash works great! They are yummy and I should have posted that they work best if you use young squash. Once they start to get seedy they are not as sweet. Thank you for the feature! I am loving using up every but of our garden and finding new ways not to let anything go to waste. I’d like to make these sweet like banana chips. Any suggestions? If I were you I would replace the salt with organic sugar. I would be interested to hear if it works and how they turn out.